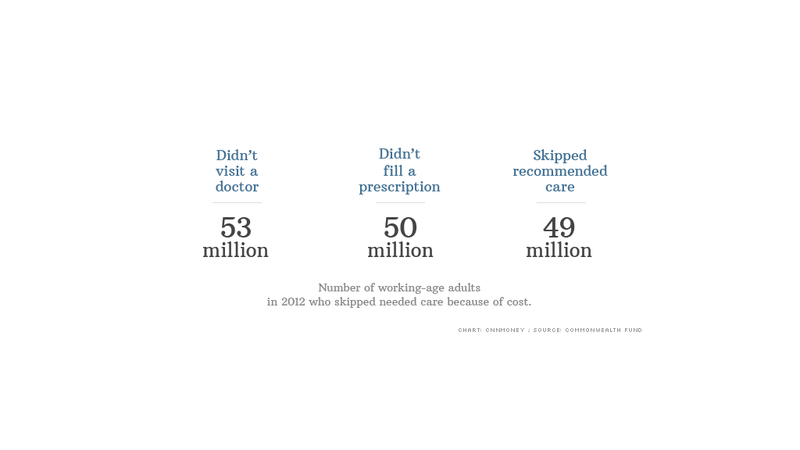 A growing number of Americans are skipping needed medical care because they can't afford it. Some 80 million people, around 43% of America's working-age adults, didn't go to the doctor or access other medical services last year because of the cost, according to the Commonwealth Fund's Biennial Health Insurance Survey, released Friday. That's up from 75 million people two years ago and 63 million in 2003. Not surprisingly, those who were uninsured or had inadequate health insurance were most likely to have trouble affording care. But 28% of working-age adults with good insurance also had to forgo treatment because of the price. Nearly three in 10 adults said they did not visit a doctor or clinic when they had a medical problem, while more than a quarter did not fill a prescription or skipped recommended tests, treatment or follow-up visits. One in five said they did not get needed specialist care. And 28% of those with a chronic condition like hypertension, diabetes, heart disease and asthma who needed medication for it reported they did not fill prescriptions or skipped doses because they couldn't afford to pay for the drugs. Even those with coverage find themselves shelling out more for deductibles and co-payments. The share of Americans with deductibles greater than $1,000 more than tripled between 2003 and 2012, reaching 25%. "Costs of health care have gone up faster than wages," said David Blumenthal, president of The Commonwealth Fund. The survey also found that 84 million people, nearly half of all working-age adults, went without health insurance for a time last year or had such high out-of-pocket expenses relative to their income that they were considered under-insured. That's up from 81 million in 2010 and 61 million in 2003. One bright spot in the report is that fewer young adults, those ages 19 to 25, were uninsured. The share fell to 41% in 2012, down from 48% two years earlier. That's due in large part to the Affordable Care Act, which allows young adults to stay on their parents insurance until age 26. All of those numbers should improve going forward as more health reform provisions take effect in 2014 -- primarily the state-based insurance exchanges, which are intended to offer affordable plans to those without work-based coverage. The Affordable Care Act, better known as Obamacare, will provide more coverage and cost protections, said Sara Collins, the study's lead author. Insurance plans offered through the state exchanges have to cover a suite of "essential" benefits, including maternity care and mental health services. They also limit the insured's out-of-pocket payments to no more than 40% of expenses.